The Mexican Bandido was a true iconic figure of the American Old West. Rough and rugged, the Banditos were a tough lot. A man's worth can easily be seen by the cut of his clothing. 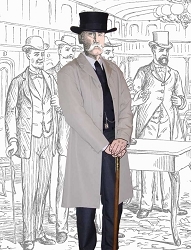 Always a true Victorian Gentleman, the Dandy was someone you kept an eye on. An enlisted cavalry man, the trooper was an invaluable asset to the American military. By the end of World War I when the boys were coming home, it was a difficult period for The Wild Bunch. 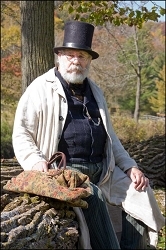 The Carpet Bagger carried all of his belongings in a carpetbag, seeking private gain after the Civil War. Turn the head of any Lady at the Dance in this Old West Suit combination, choose from any combination and material. Choose from a Vest and Coat, Coat and Trousers or get all three, you will turn the heads of the Ladies and the Gents alike. 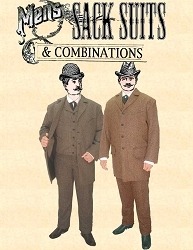 Ensure that you always look your best with a Three piece Old West style Suit, in matching material and the right sizes for you. It was a time of great exploration, great expansion, and great upheaval and this was also represented in the fashions of the time. These epochs brought about several distinctive and representative styles for the men who lived through them. Obviously, when one thinks of the 1800s they think of the American Civil War and Civil War clothes as the dominant fashion of the time. But there was so much more than Civil War clothing! 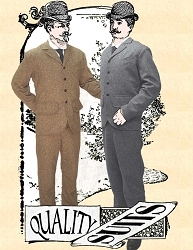 Near the turn of the 18th century, men began to pay particular attention to their physical appearance, often imitating the aristocratic elite of the times despite middle class backgrounds. 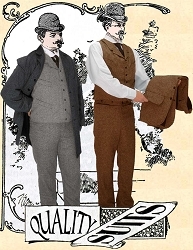 This brought about the introduction of the Dandy Outfit, for men in search of a refined look of pedigree and success. Soon after the Civil War and the era of Civil War clothes, the iconic image of the Carpetbagger emerged. The name was an allusion to the fact that most carried their belongings in a single sturdy carpet bag as they moved from town to town after moving South looking for work in the Reconstruction Era. The fashions of the time are also influenced from south-of-the-border with bandito outfits and more refined Spanish rancher outfits called Vaquero outfits. Find any of these distinctive looks from Civil War clothing to the more refined Dandy outfits at River Junction Trade Co.